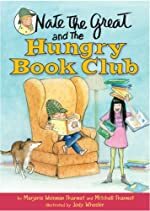 Review: Nate the Great and the Hungry Book Club by: Marjorie Weinman, and Mitchell Sharmat, is a great children mystery. There is Nate the Great; he is a detective, a very clumsy detective to be exact. He is working hard to state HIS case correctly to his friend Rosamond, who thinks her conclusion is correct. Rosamond is one of Nates close friends. Not only are they friends, but she is the president of the book club that she created. When Rosamond goes into the kitchen to get something, she notices that something isn’t right with the cook book she had recently purchased. She read it through before she bought it, and everything was in quite fine condition. But now something has happened to her book. The following day the same thing happens to another one of her books. She is now FURIOUS; she wonders what people could possibly want with her books? Will they ever find out what happened? Or will this mystery stay un-solved? First thing in the morning Rosamond goes to the book store and buys some books so she can read them to all of the members of her club, and then share their feelings about the book with one another. After checking out all of the books, and closely reading all of them, she walks over to Nate’s house, with all of the books on her head. When she walks in she tumbles and the books she is carrying on her head fall ker plop onto the floor. She picks them up, and tells Nate the exciting news about her book club. Rosamond has some bad news also for Nate; someone is ripping pages out of her books. So that day Nate goes to the meeting with her to collect clues. Nate investigates, determined to make this mystery history. I have two younger sisters both at the age of four, and I decided to read this story to them. Now they keep asking for me to read it again, and again! This book is a very good book, and is very consistent. It does not go off topic, which makes it much easier for my sisters to understand. With a rating of five, I will give this book a five. I did so because of how much detail is in the book, which makes you feel like you are there, trying to find out what happens. An example is: “I sat down in my favorite chair. I opened my Harvard Hedgehog book. I turned to page fifteen. There was a picture of Harvard getting his photo taken in front of a big clock.” When I was reading that part, I felt like there was a movie in my head, remaking from a book, to the big screen. I would recommend this book to any young reader who is interested in sleuthing, or loves to read. This is only one book from the series of Nate the Great, so if you read the book and you like it, you should check out the rest of the series. I think Marjorie Weinman, and Mitchell Sharmat should keep writing young children’s books, because I see how happy my sisters get when I read it to them, I can’t imagine how many other children get happy when they also read it. So I think they should keep writing, and keep putting smiles on children’s faces! Review written by Briana (6th grade student). We would like to thank Random House for providing a copy of Nate the Great and the Hungry Book Club for this review. Have you read Nate the Great and the Hungry Book Club? How would you rate it? This sounds like a fun "whodunit" series! It's funny (but good!) that your sisters want you to read to them. You're setting a fine example for them by showing how important books are and how they can make people (like your sisters) so happy.